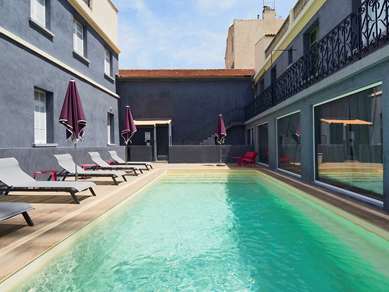 Our hotel in Marseille is located just outside the city and will be an ideal point of departure to go out and discover the Côte Bleue, the Venise of Provence, and the country around Aix. 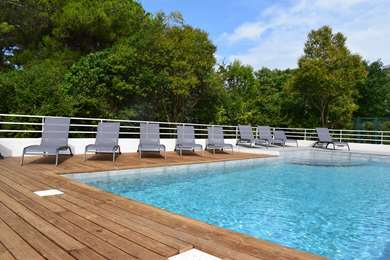 Hotel Kyriad Marseille – Les Pennes-Mirabeau Aéroport is just over 4 miles from Marseille-Provence Airport, the Airbus Helicopters site and the Aix TGV train station. You will be 9 miles from downtown Aix and the port of Marseille-la Joliette and 3 miles from the Plan de Campagne shopping area. 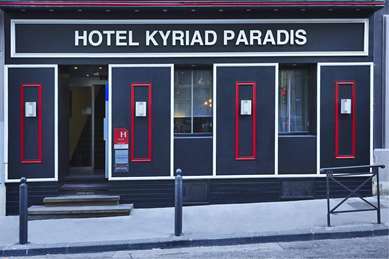 The 3-star Hotel-Restaurant Kyriad Marseille – Les Pennes-Mirabeau Aéroport has 42 rooms with personalized reception 24 hours a day and free private closed parking for guests. We also have a meeting room for your seminars or study days as well as all the commodities you need for a very pleasant stay in our beautiful region. All of the common areas in our hotel are wheelchair accessible and we have 2 rooms that are specially adapted for people with reduced mobility. 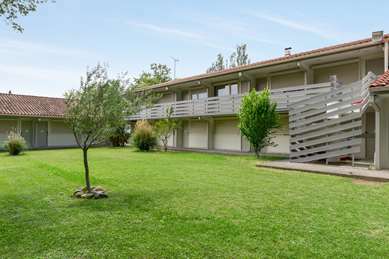 Our hotel has 42 rooms (singles, doubles, connecting and quadruples) that will meet all your needs, whether you have come alone, as a couple or with your family or as a group. Two rooms are specially adapted to accommodate people with reduced mobility. 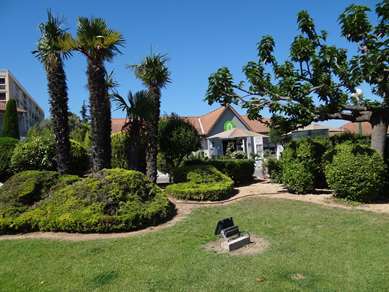 All our rooms are air-conditioned and have a bathroom with bathtub or shower (hair dryer provided). You will have a flat-screen LCD TV with SAT, Canal+ and beIN SPORTS channels. You have free access to the hotel Wi-Fi network. A courtesy tray with a kettle, tea, coffee and cookies is available in your room. • Breakfast: from 6:30 am to 9:30 am weekdays, up to 10:00 am on weekends and holidays. Every morning, our establishment offers an all-you-can-eat breakfast buffet that includes everything you need to make a rich and balanced meal. We have been stay there during on LF Sports International Cup with our team. I dont know even there was any housekeeping staff. I couldnt see them. They can not speak english however they make us feel like we have to know french. Behalf on my friend i can tell that we did not like any staff of service at this jail! The choking all pervading smell of old building/carpet, cleaning substances, smoke(? ), and maybe camphor(?) I'm not very particular to how the room smells, but this one was unpleasant and it clings to you and your clothes. It wasn't only in my room, once you pass the door from the reception towards the rooms you smell it immediately. It is not present at the reception desk or in the breakfast area. I spend one night before my flight back home, arrived around 10PM and left at 9AM the next day. All in all, if it weren't for the smell it's not a bad budget option. I would not stay again, because of the terrible smell. - Good air conditioning, wifi ok.
- Small room & bathroom, but shower is ok. This is a hotel that have seen better days. The room I had was not in a very good condition and it also smelt strongly of smoke from many guests before me. I still asked for a non-smoking room. The service was good and the staff was very friendly and also gave me a toothbrush as I had forgotten mine at home. The dinner we had in the restaurant was also much better than anticipated. 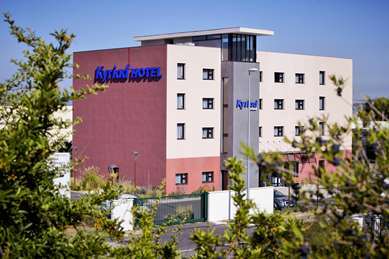 If you need a hotel not too far away from MArseille airport then the Kyriad is ok but don't expect too much. Thanks for your comment that help us to improve the accomodation of our hotel. We are always sorry that people don't respect the fact that is forbidden to smoke in our rooms. As you mentionned it we gave you another room for your convenience.We are pleased to that you appreciated our dinner and all the staff. As you noticed it we are near the airport and have a service shutlle.We expected to see you once again.Pascal LLEDO. 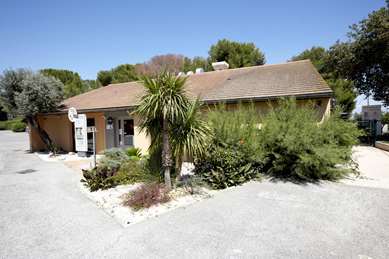 We booked two nights at this Kyriad at the end of a two-week trip to France, mostly driving through Provence. We lucked out, because being mostly a business hotel about 10 minutes drive from the airport, they offer their rooms fairly cheap during weekends, when the hotel is pretty empty. 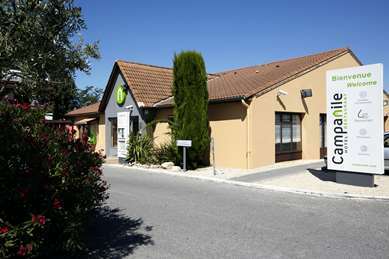 We had stayed at a Kyriad in Avignon that had previously been a Holiday Inn Express, so our expectations were high. Unfortunately, it was not nearly the same quality. Each Kyriad is individually owned, and I believe they pay a fee to use the Kyriad name. This had more the feel of a motel than a hotel. The receptionist was very sweet and check in was easy. There were no elevators, so we had to carry our bags (unassisted) up three flights of stairs. The place is in dire need of refurbishment (humidity spots on the walls, some peeling paint, stains on the carpets) but I can't totally say it's run down. The room was very spacious and clean. We supposedly had a smoke-less room, but it smelled as though the previous guest smoked like a chimney. When we asked to switch to another triple room, they did their best, but they only had one other room our size and it was already taken. We simply opened the window for a couple of hours and most of the smoke odor was gone. The hotel is perfect for anyone who has an early morning flight as we did. We also had to return our rental car, so we didn't want to waste any time driving through the city to get to the airport. We even made a dry run the day before to make sure we knew were everything was! If you have a car, it's not too bad to visit Marseille. It was about a 20 minute drive and we were able to spend an entire day on the beach and dining in the city. One surprise from the hotel came from the hotel restaurant. They offer breakfast for 10 Euros (which we skipped), but we did go down for dinner. We were very impressed by the food. It was delicious! We even requested a special order on the omelette, and it was truly one of the best meals we had while in France, and that's saying something! If you're looking for luxury, this is not it. 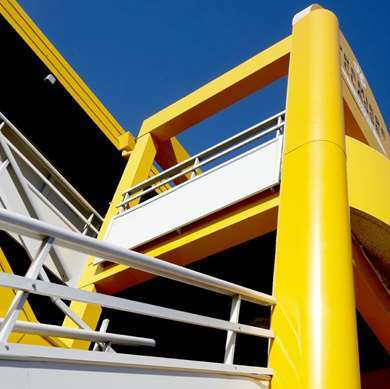 If you need a clean place to stay with safe and free parking (it's gated) near the airport, then this is your hotel. Staff is friendly and helpful and rooms are clean and comfortable.